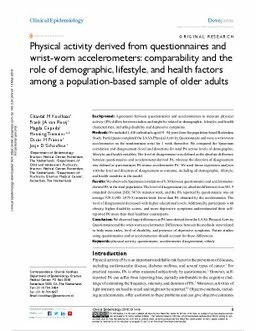 Background: Agreement between questionnaires and accelerometers to measure physical activity (PA) differs between studies and might be related to demographic, lifestyle, and health characteristics, including disability and depressive symptoms. Methods: We included 1,410 individuals aged 51–94 years from the population-based Rotterdam Study. Participants completed the LASA Physical Activity Questionnaire and wore a wrist-worn accelerometer on the nondominant wrist for 1 week thereafter. We compared the Spearman correlation and disagreement (level and direction) for total PA across levels of demographic, lifestyle, and health variables. The level of disagreement was defined as the absolute difference between questionnaire- and accelerometer-derived PA, whereas the direction of disagreement was defined as questionnaire PA minus accelerometer PA. We used linear regression analyses with the level and direction of disagreement as outcome, including all demographic, lifestyle, and health variables in the model. Results: We observed a Spearman correlation of 0.30 between questionnaire- and accelerometer-derived PA in the total population. The level of disagreement (ie, absolute difference) was 941.9 (standard deviation [SD] 747.0) minutes/week, and the PA reported by questionnaire was on average 529.4 (SD 1,079.5) minutes/week lower than PA obtained by the accelerometer. The level of disagreement decreased with higher educational levels. Additionally, participants with obesity, higher disability scores, and more depressive symptoms underestimated their self-reported PA more than their healthier counterparts. Conclusion: We observed large differences in PA time derived from the LASA Physical Activity Questionnaire and the wrist-worn accelerometer. Differences between the methods were related to body-mass index, level of disability, and presence of depressive symptoms. Future studies using questionnaires and/or accelerometers should account for these differences.